It’s been a while since our last update and all because we were preparing a huge release: two new databases in the Competitor SEO / PPC research, website localization and several new features for the competitor analysis. We’ve rolled out new databases for Competitor SEO / PPC research: Google Denmark with 12 million queries and Google Belgium with 2 million queries. More data for a fast and comprehensive analysis of the competitive domains, specific URLs, and keywords. Yay! Let us know in the comments below which countries we need to add to our roadmap. We are constantly improving the Competitor SEO / PPC research tool, and now we’ve added a new option to filter by the country. 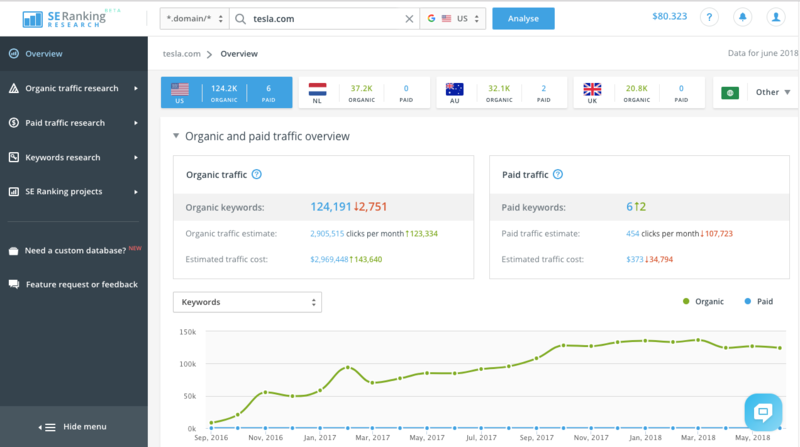 Now you’ll be able to see the number of detected keywords in organic and paid search in all available databases in the tool while analyzing any domain in the specific country. This will help to evaluate promotional efforts the domain is pushing beyond a single country environment and measure how many keywords are getting promoted in other countries. 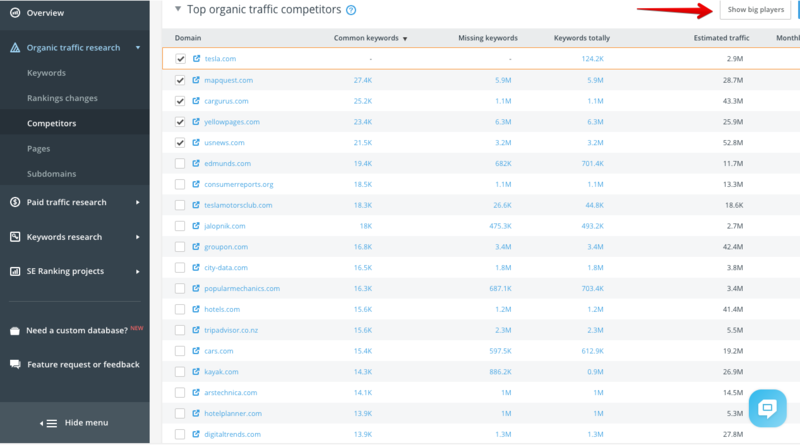 A new filter has been added to the Organic and Paid traffic research sections of the Keywords tab. It’s also shown on the Overview page that opens as a first view in the analysis report. Previously, when analyzing main competitors of a certain domain sites like wikipedia or youtube might popup as your competitor because they hold a lot of keywords that cross with yours. Such view makes it hard to distinguish the actual main or local market players. We’ve eliminated this problem by hiding those huge sites so you can get a better picture when analyzing the domain in the “Competitors” section. If you want to view the entire list of competitors, including these big domains, just change your preference and get a different view. The new feature is available in Paid and Organic traffic research tab. The geography of our customers is growing and so we’ve translated our website and platform into different languages to accommodate this growth. With this release we’ve rolled out a Spanish version of the website. Next in line is Dutch and Japanese. Stay tuned! We’ve just released database for Greece. So you can check it. Please add MX database. Pretty please! Thanks. We will definitely add it. Any plans to add India database…. Is the Spanish version available as part of a white label subscription? You can change the language of the platform to any, which is available. Depending on the сlient’s preferences, choose the language when creating a sub-account. I don’t have to spend money on SEMRush anymore. Also, SE Ranking has backlink info for competitors so I don’t need to spend money on ahrefs! Thanks SE Ranking. This is the most bang for my buck. Francisco, thanks! Great, that you like our tools that much. Any chance to add Indonesia Database, please? Sure, we are planning to add all the countries.